Voice Dream Reader is a robust reading app with text to speech capabilities for PDF, web-based text, Word documents, ePub books both on-line and offline for the iPad and iPhone (9.99). 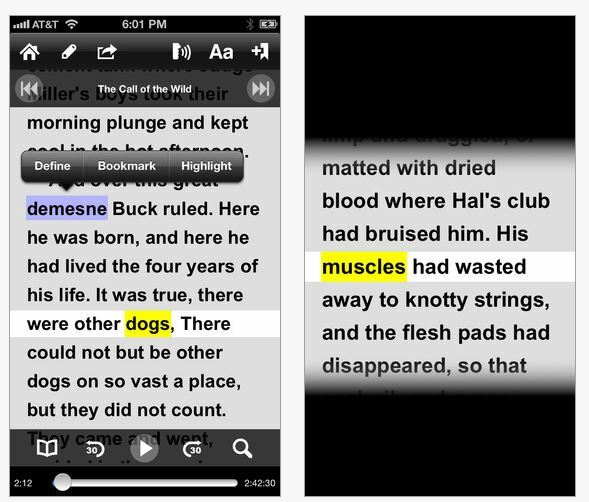 A Voice Dream Reader lite version is available which reads a couple of lines at a time but is fully featured. Created by Winston Chen while living for a year on a small island in the Arctic Circle, Voice Dream Reader App has continued to evolve according to users needs and requests. Winston Chen has been a responsive developer committed to improving his app to needs of his users. When Voice Dream Reader app first debuted, providing him a few suggestions found him responsive and eager to improve his app based on special needs users with print disabilities. His committment of improving this app for those with learning challenges has been remarkable with continual improvements made in his app allowing additional formats and features to make this app versatile for those with a print disability. Winston’s development of Voice Dream Reader started with his journey to Rødøy, a small granite island jutting from the Norwegian Sea north of the Arctic Circle. He and his wife took a mid-life retirement year on this remote island. As a software developer, he developed Voice Dream Reader app, providing text to speech capabilities. He continues to develop the app as he returns from his retirement to his work life in Boston. Seeing the (Northern) Light: A Temporary Arctic Retirement on NPR provides the account of Winston’s sabbatical and app development’s. It’s an inspiring story of this developer who continues to listen and improve this app for individuals with special needs. For more information visit Voice Dream Reader’s website or down load his Voice Dream Reader Lite to trial. This is a flexible app for individuals needing text to speech capabilities for a variety of formats and with many helpful features. A great app for your teaching, OT, rehab mTool Kit! This entry was posted in Adults with LD, App Reviews, Apps for OT's, Apps for Special Needs, iPad, iPhone, iPod, Learning Disability, Occupational Therapy, Reading, Special education, Special Education Teacher, Special Needs, Text to Speech, Writing and tagged App Review, iPad, iPhone, iPod, Learning Disability, occupational therapy, OT Apps, Reading, Text to Speech, Writing. Bookmark the permalink.